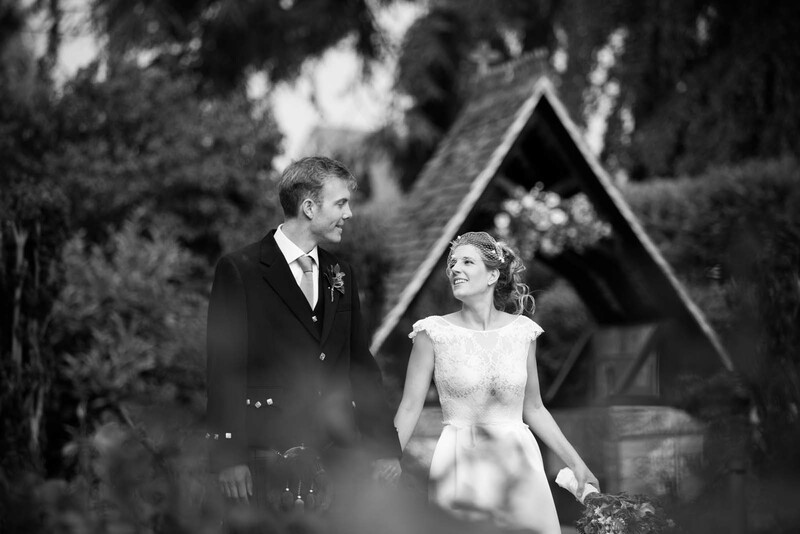 Steffi and Tim got married on a beautiful Spring day in May. 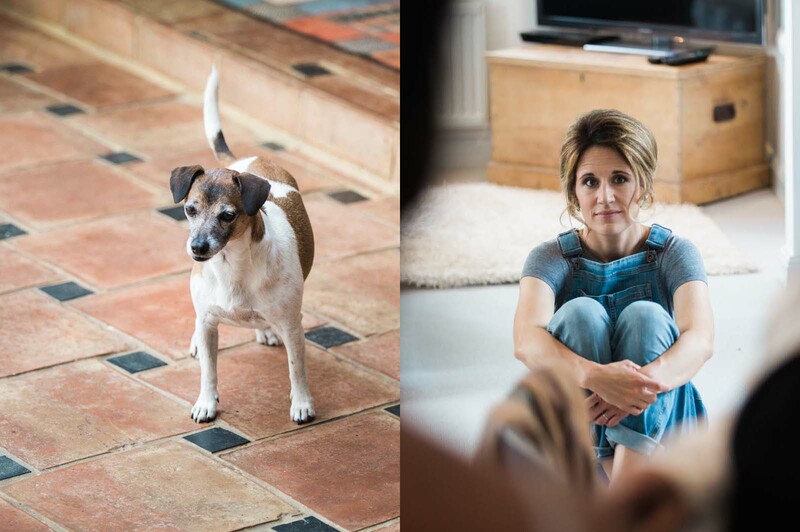 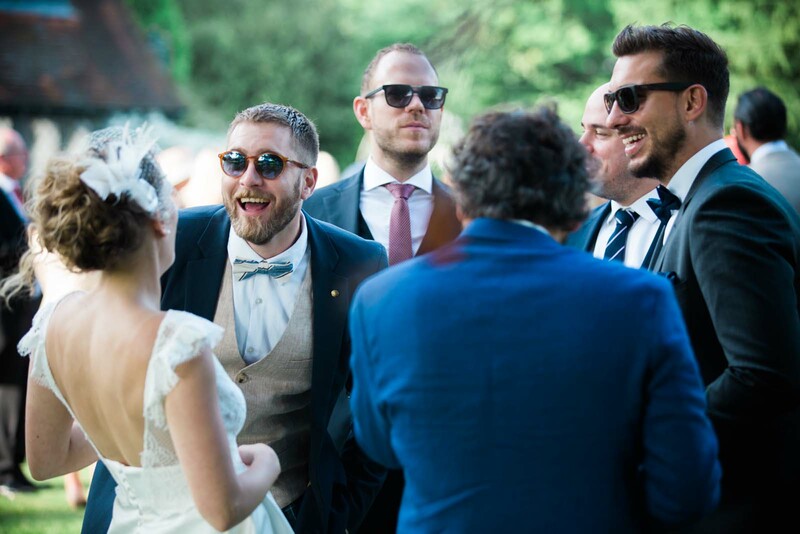 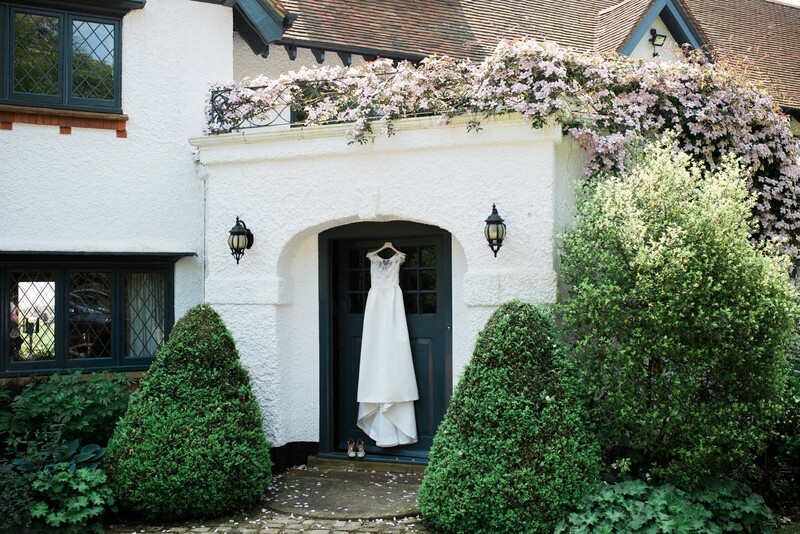 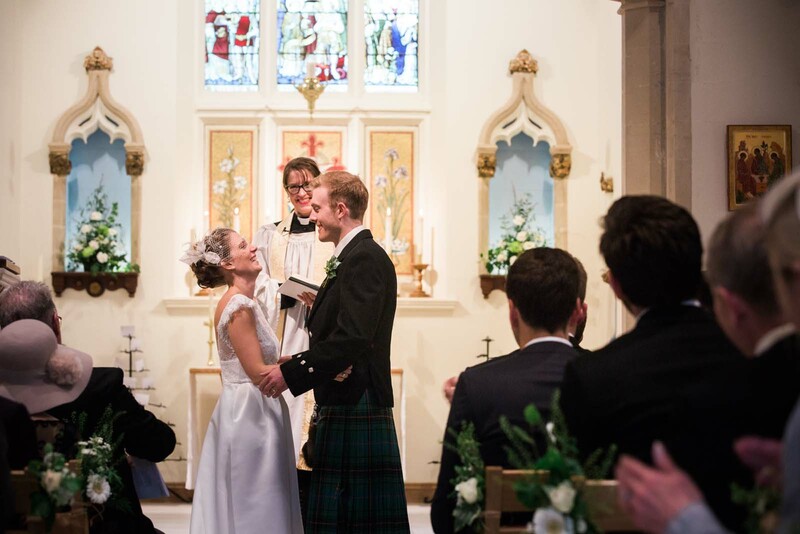 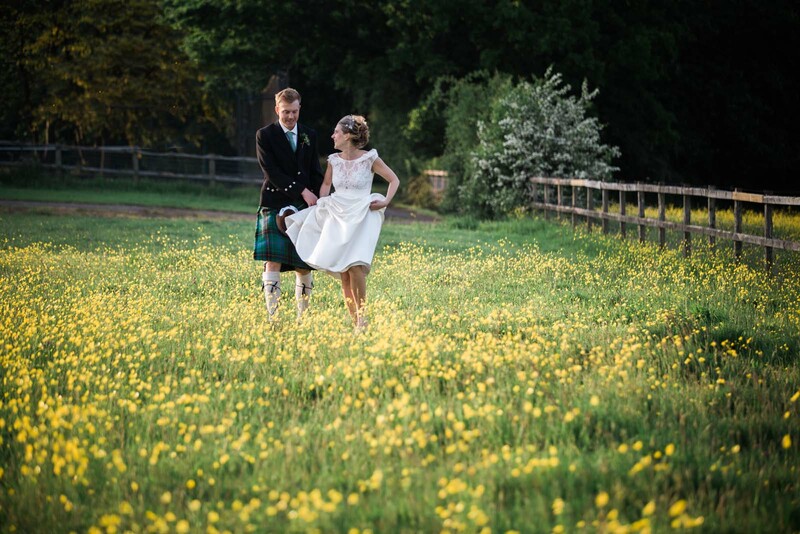 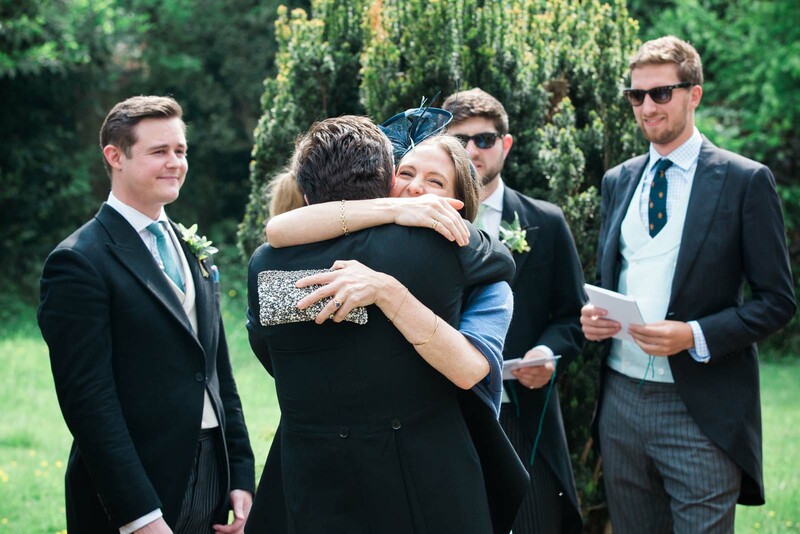 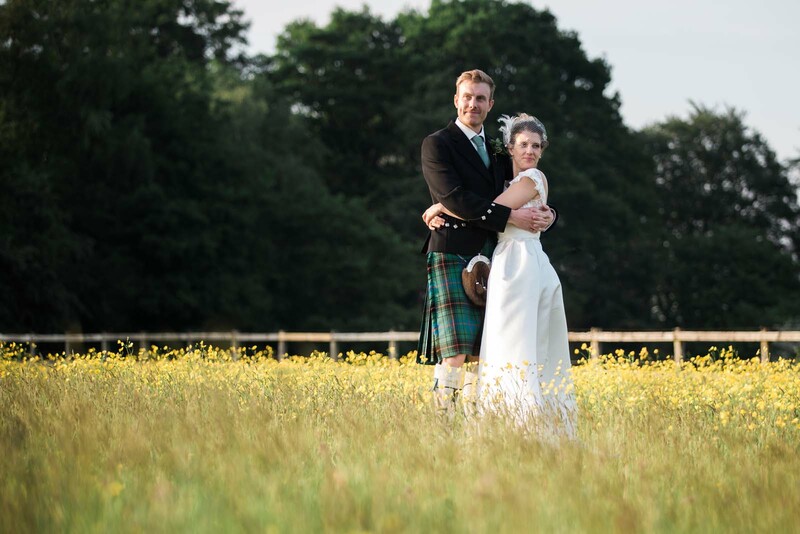 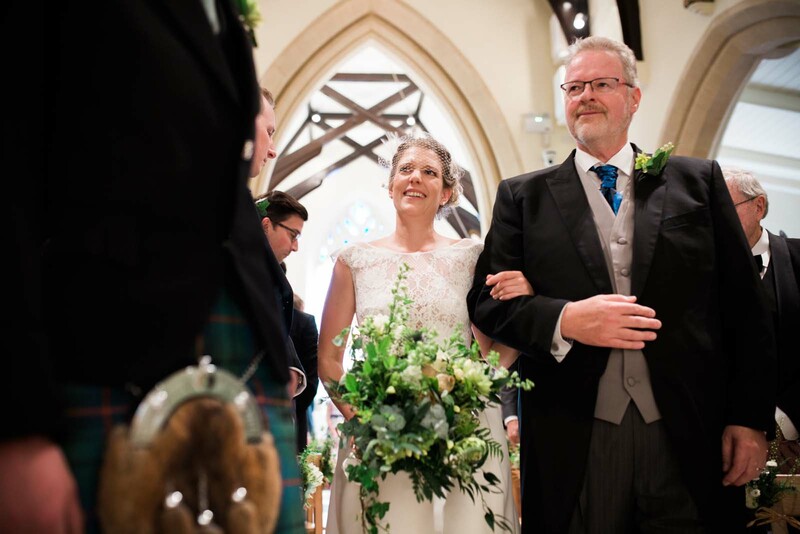 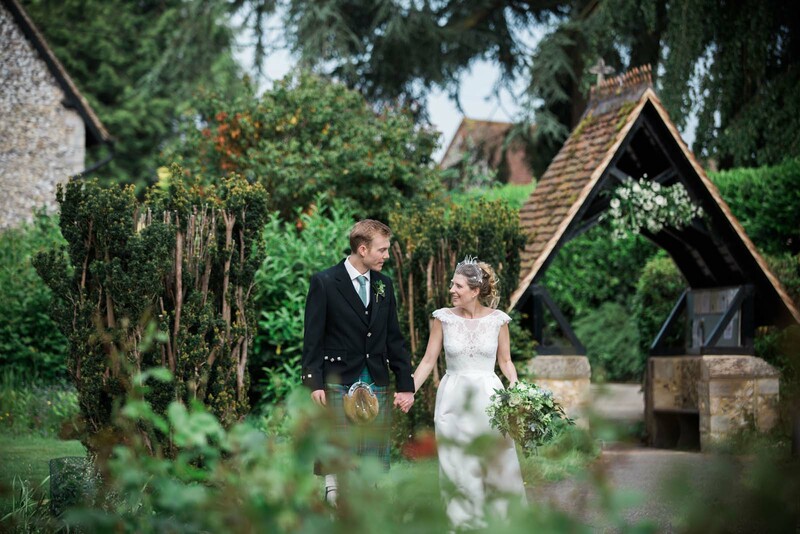 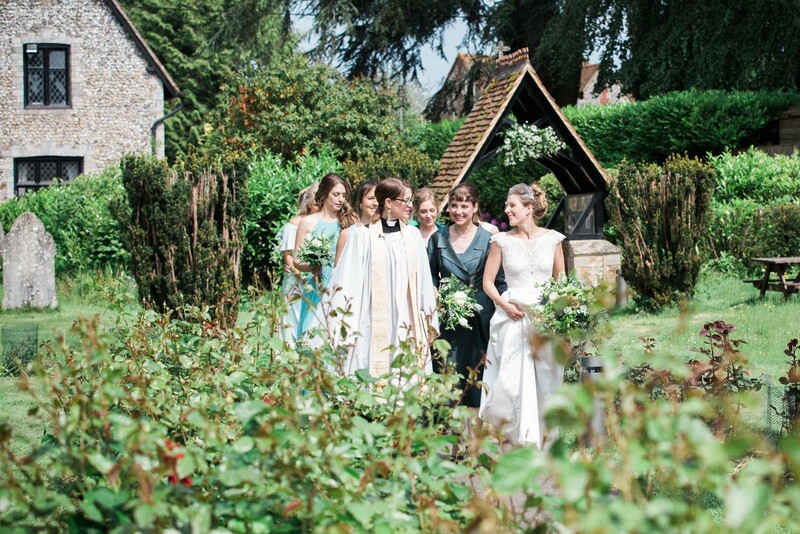 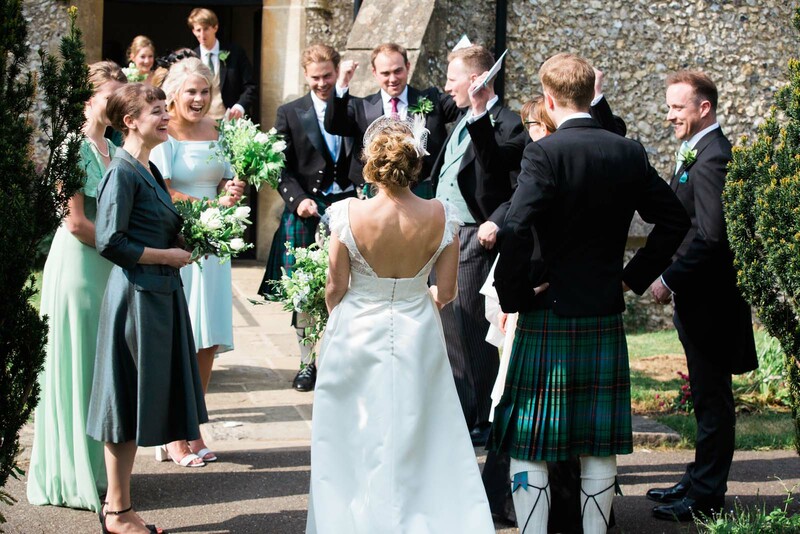 The ceremony took place at their local church followed by a wedding reception in the grounds of Tim’s family home in Great Missenden, Buckinghamshire. 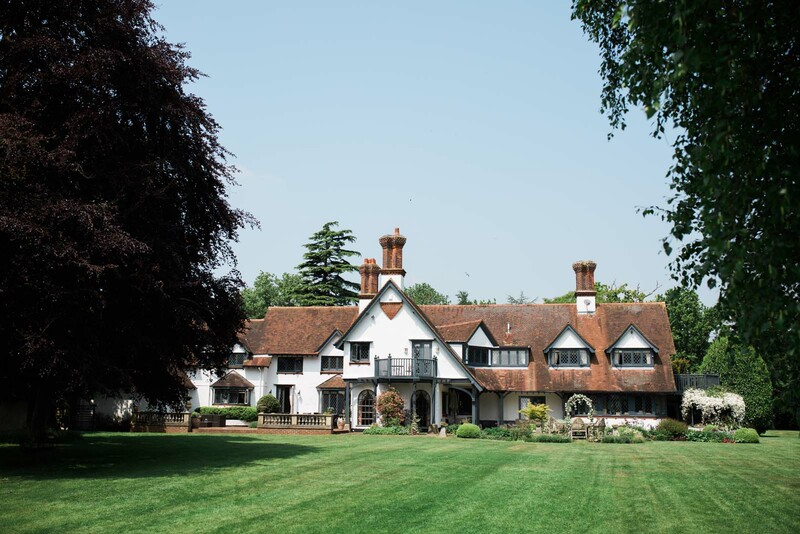 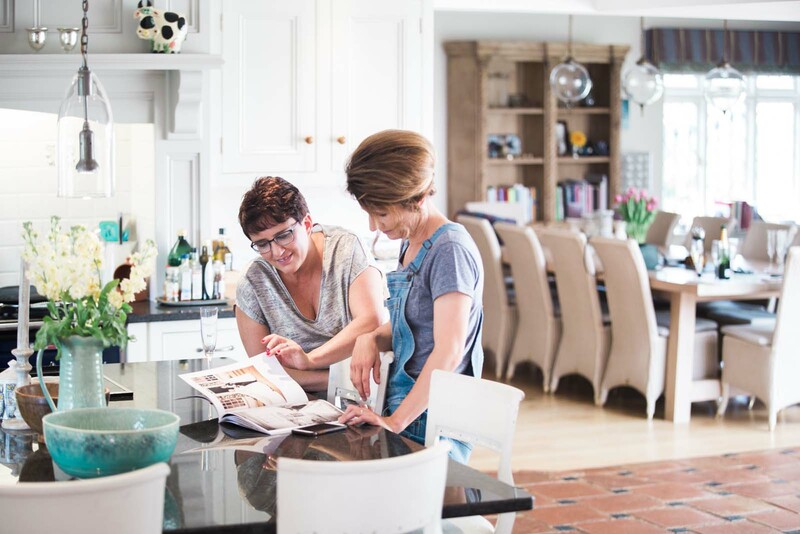 The private residence is nestled in a rural setting with extensive grounds and commanding views of the English countryside. 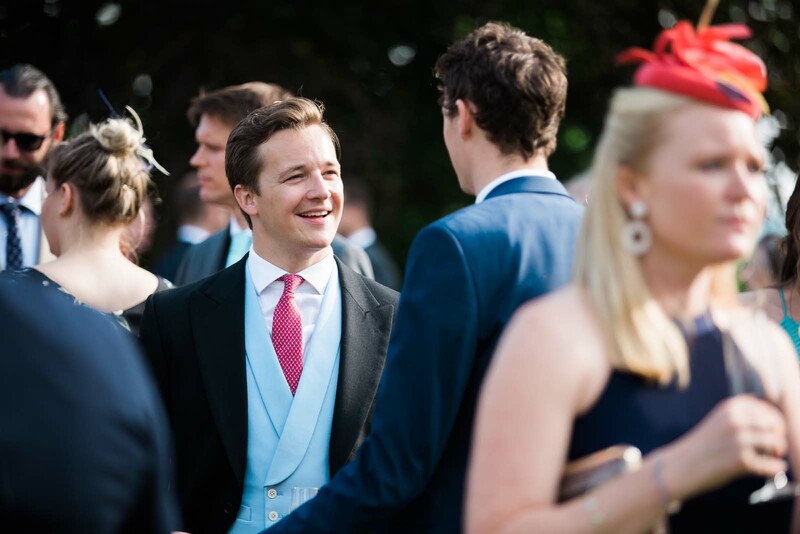 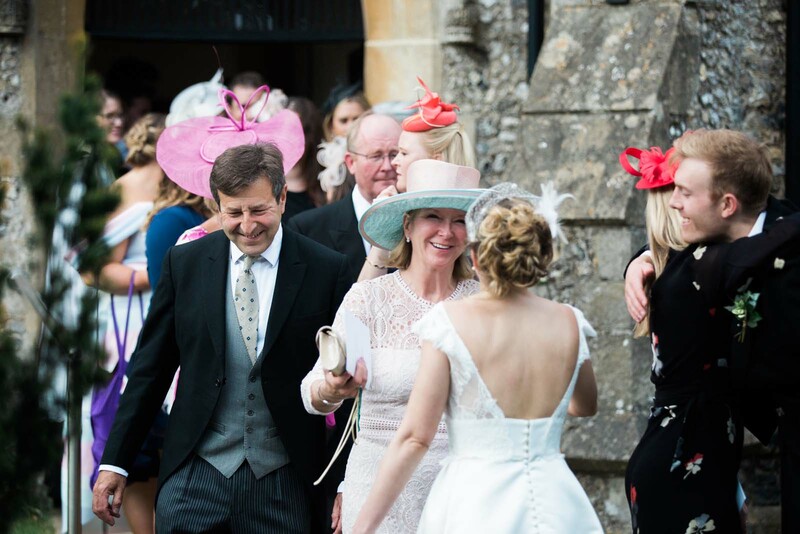 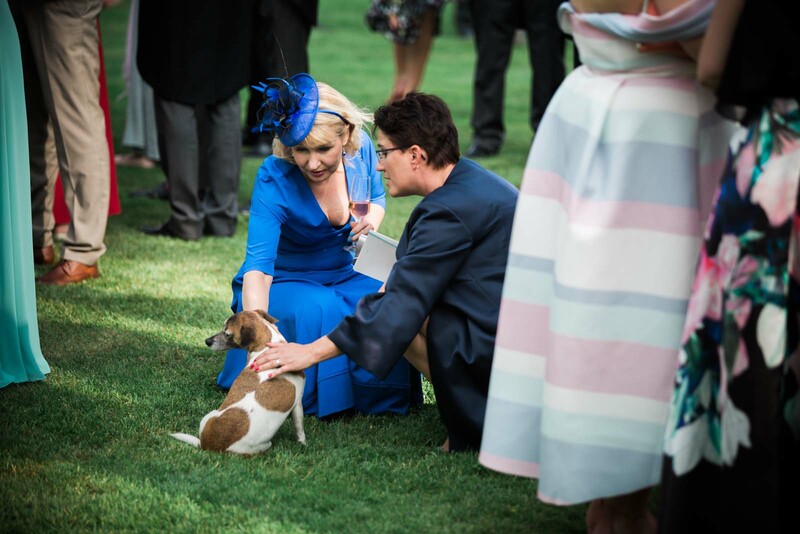 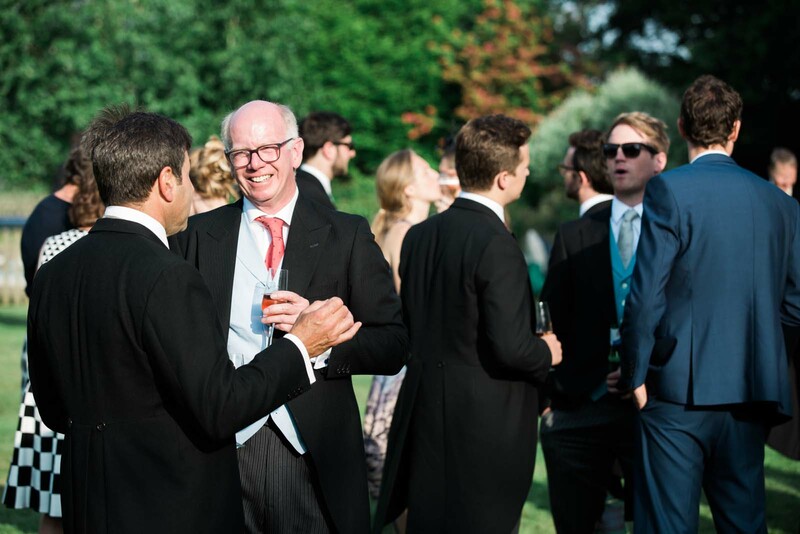 Welcome drinks and canapès were served on the lawn where guests could enjoy stunning views of the grounds. 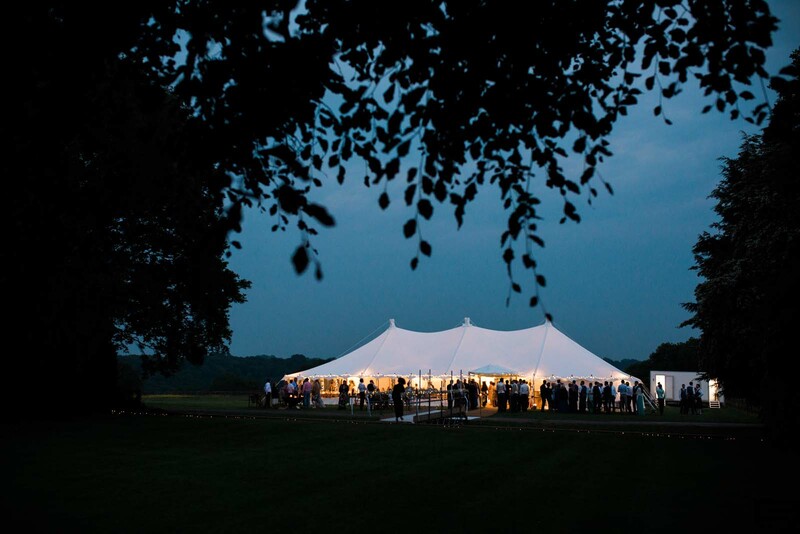 The marquee stood beautifully decorated in the field across the ha-ha. 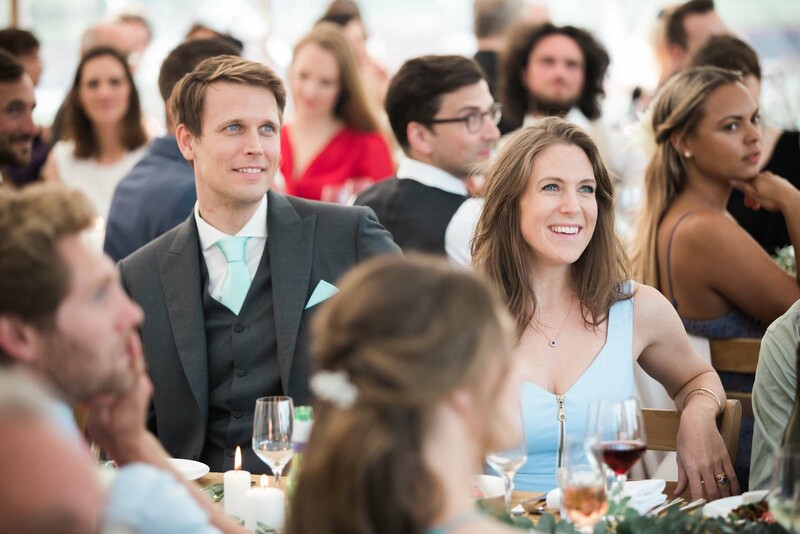 Guests were invited to make their way across the temporary bridge – decorated with gypsophila and ribbon – to enjoy the delicious wedding meal. 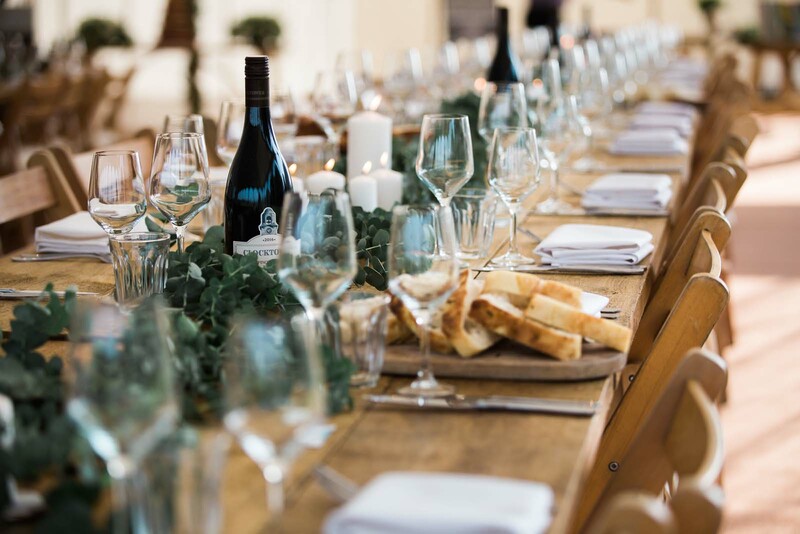 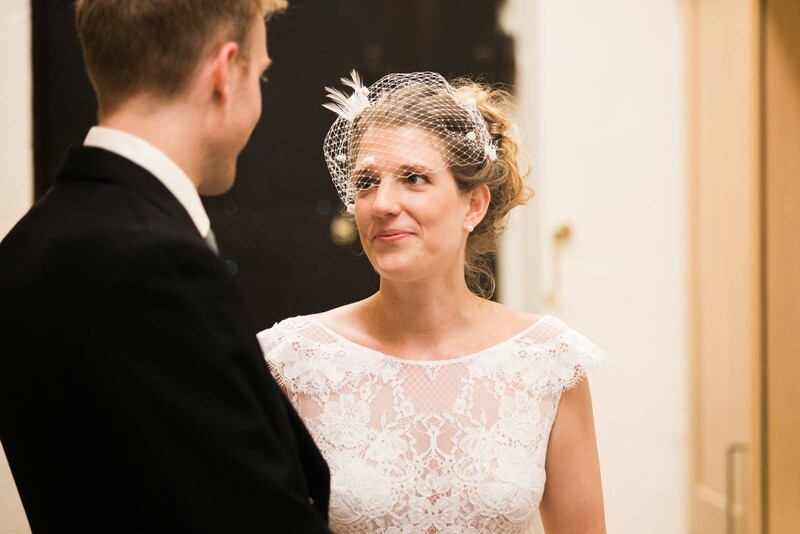 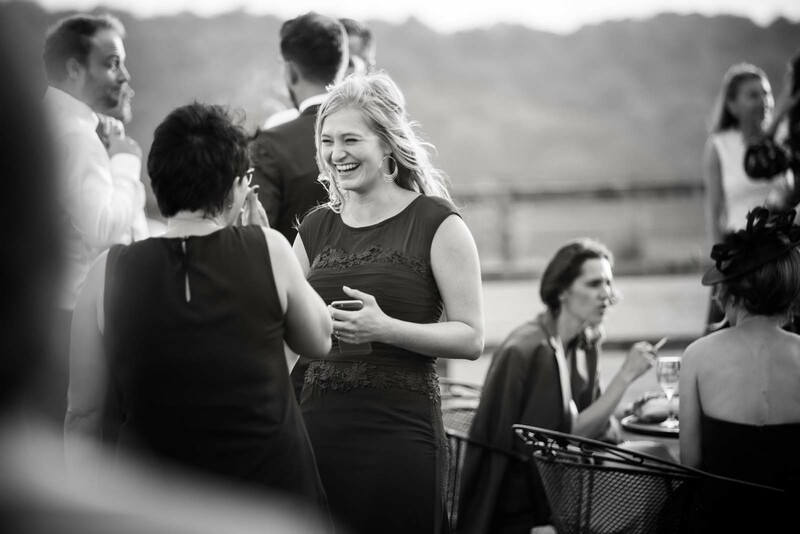 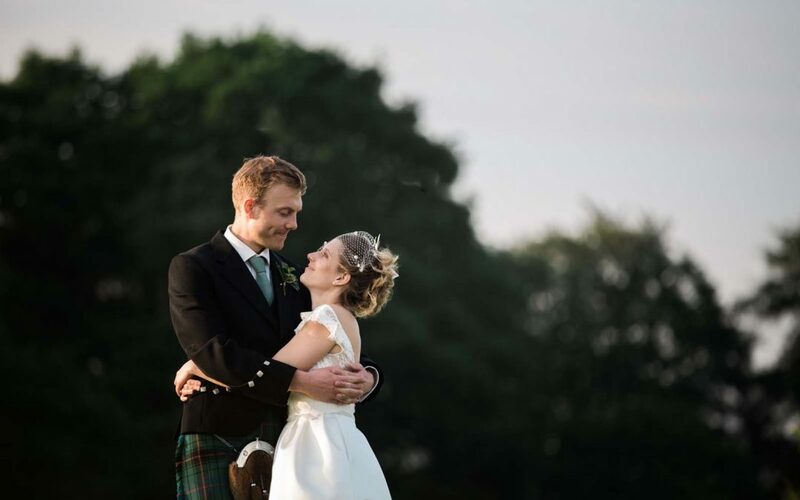 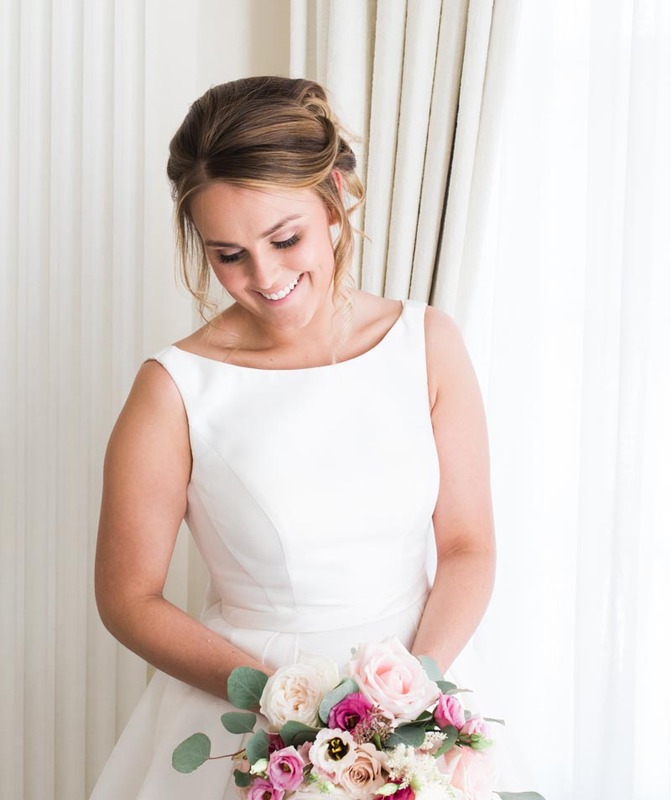 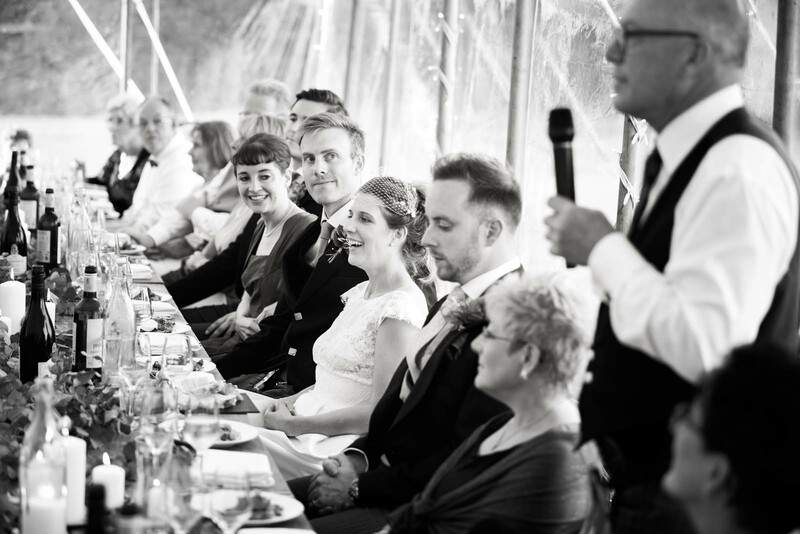 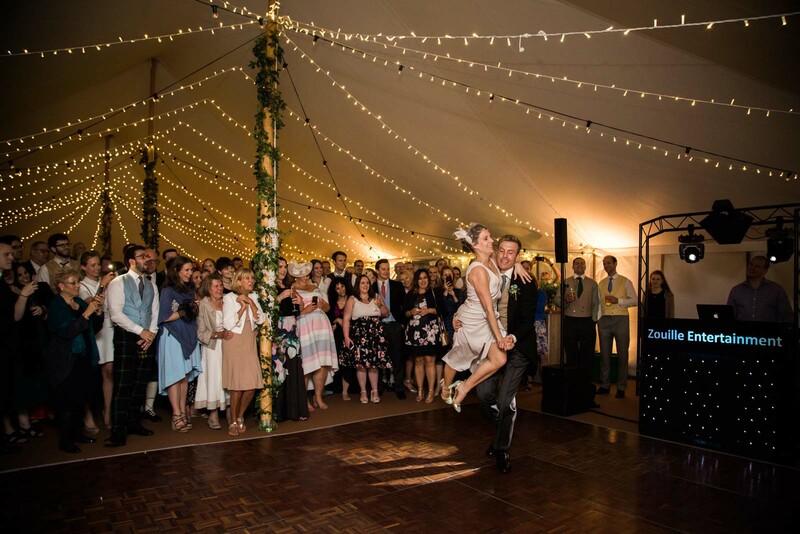 The wedding reception was carefully planned and coordinated by Jessica from Conker Events, incorporating all Steffi’s and Tim’s well thought-out details and ensuring the day ran like clockwork. 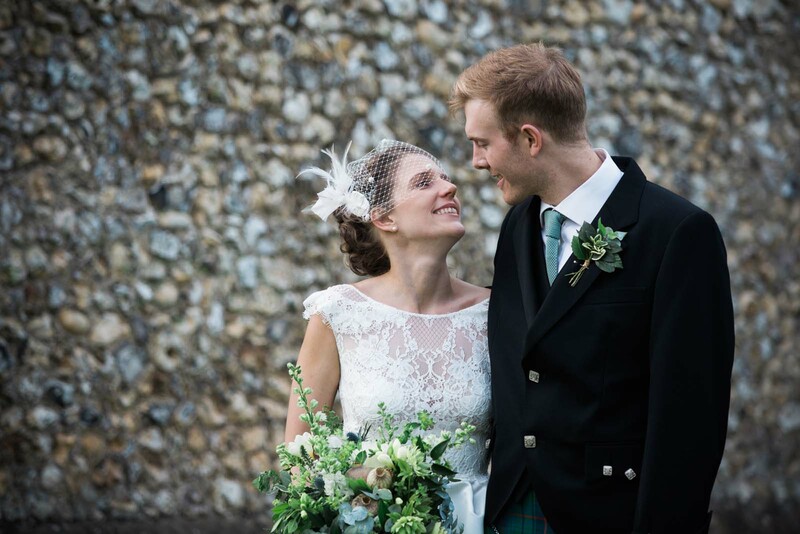 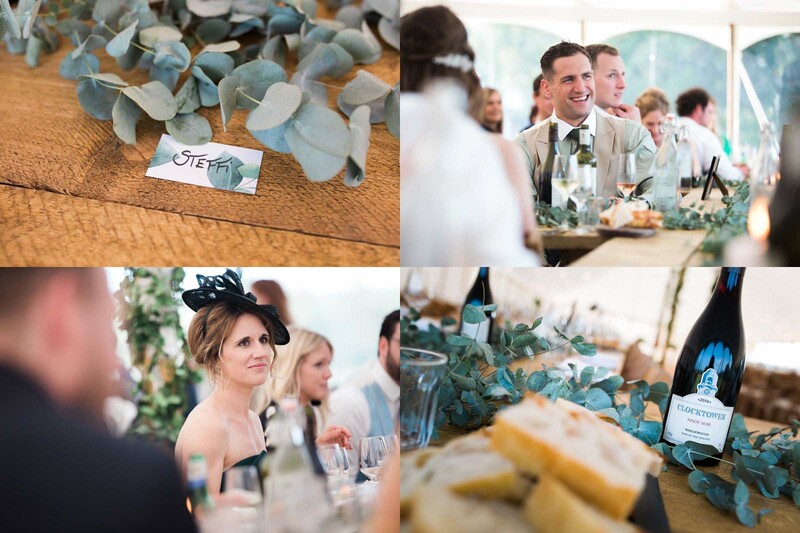 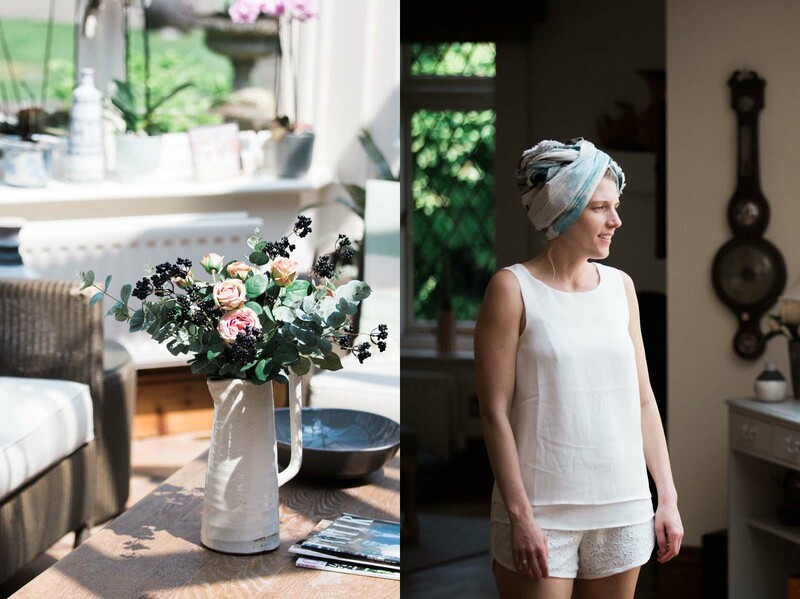 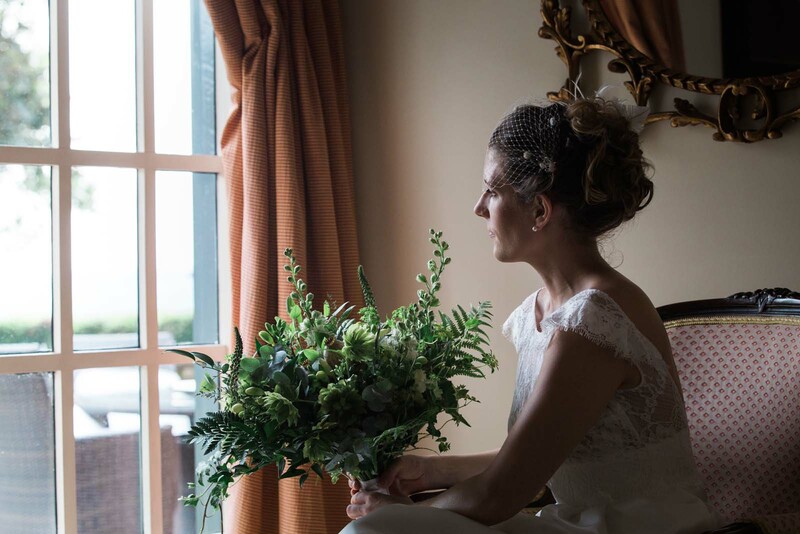 The wedding colours were all shades of green – a gentle nod to Steffi’s passion for the environment. 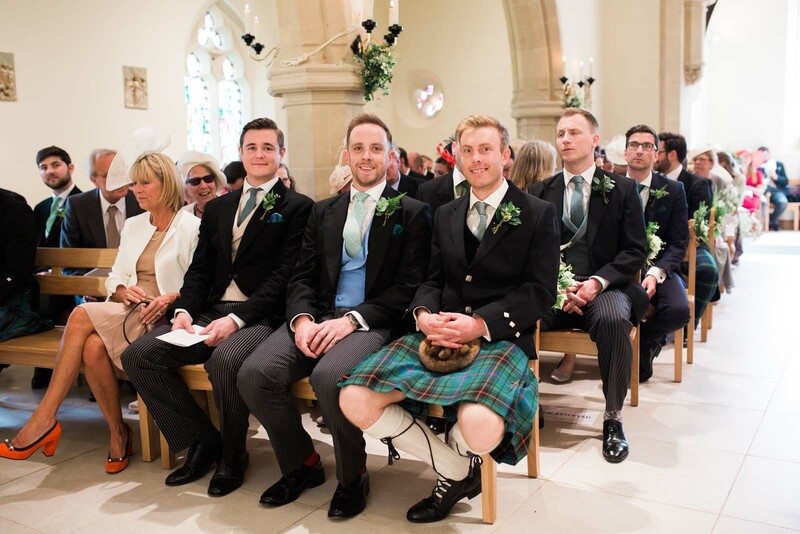 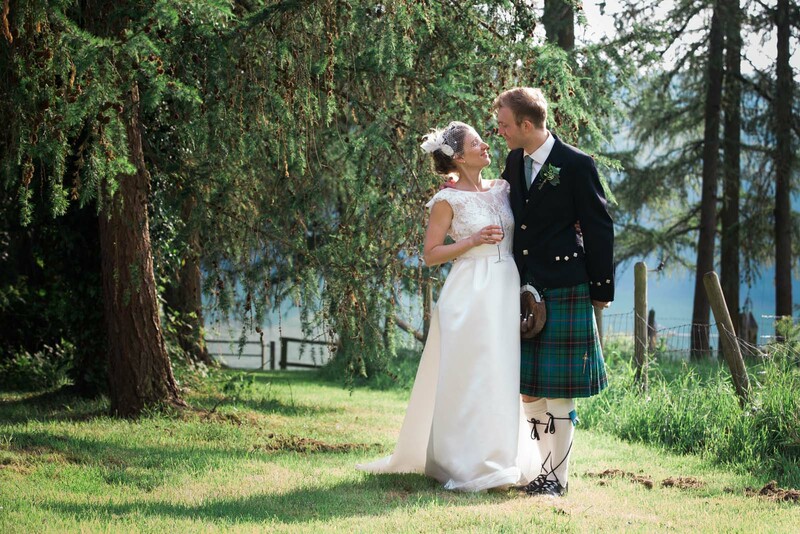 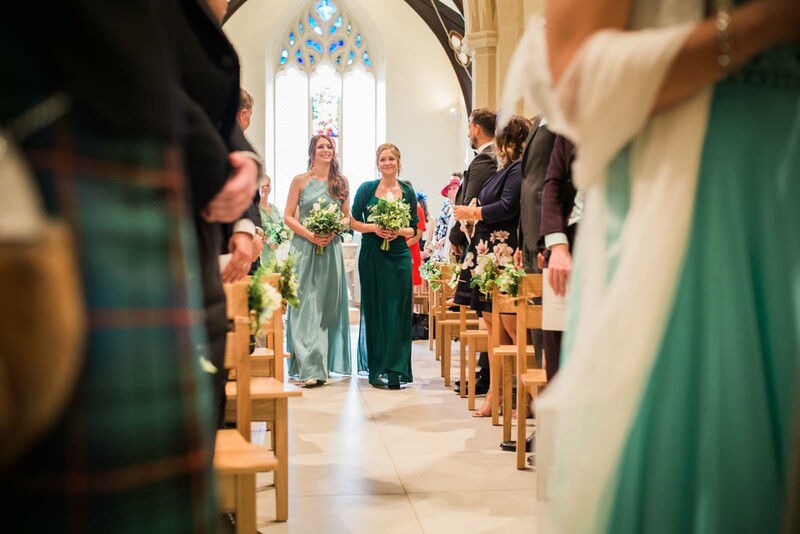 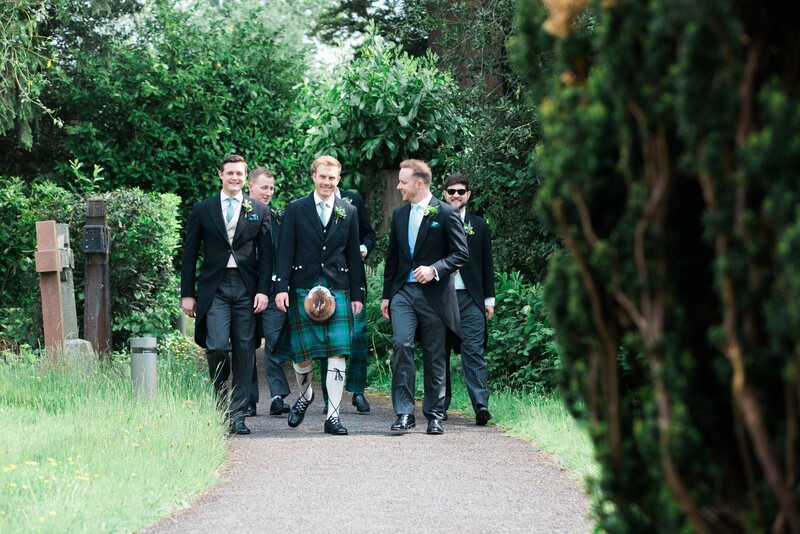 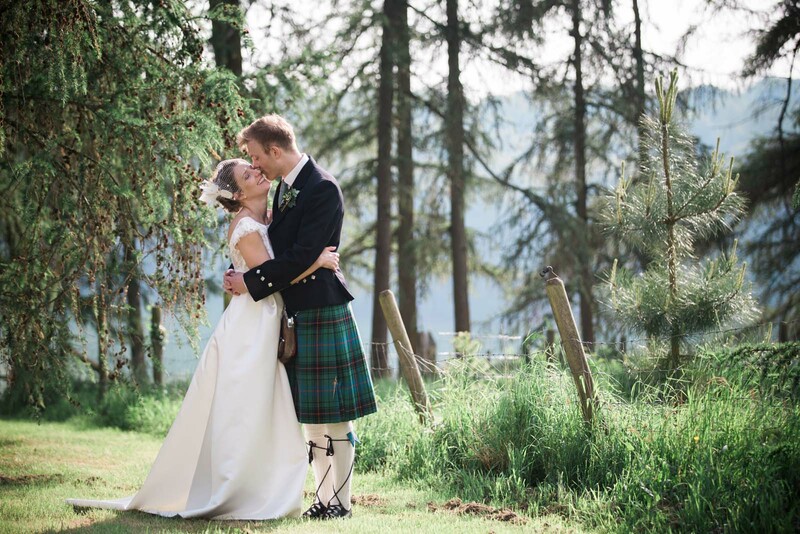 Bridesmaids wore dresses of varying shades of green and groomsmen looked handsome in kilts. 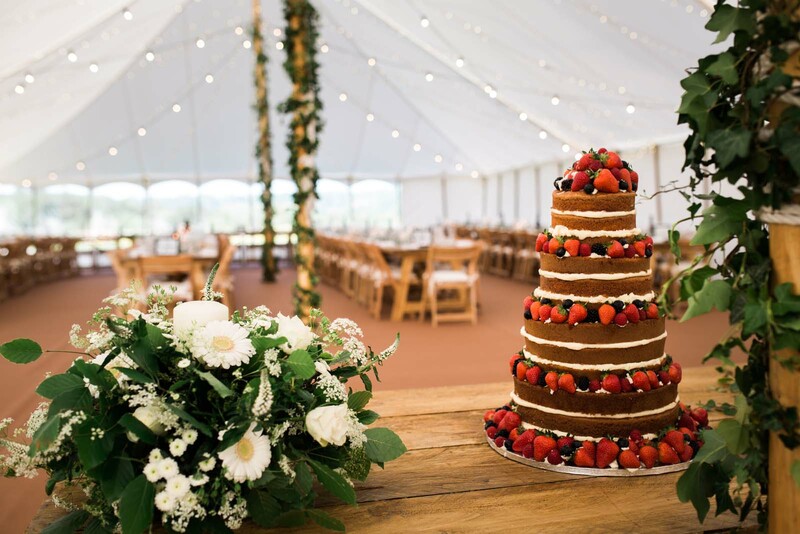 Everything from the the place cards to the table centrepieces, the naked wedding cake and rustic wooden furniture spoke of a traditional English country wedding. 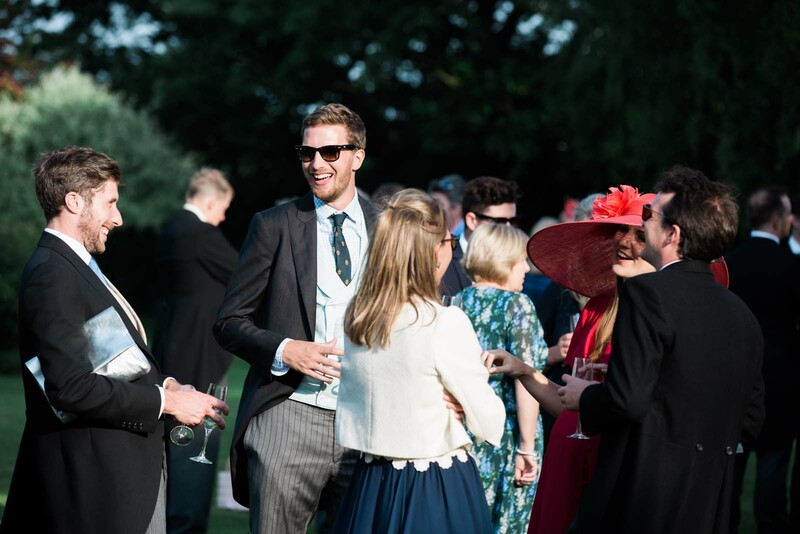 The weather was perfect and the atmosphere electric. 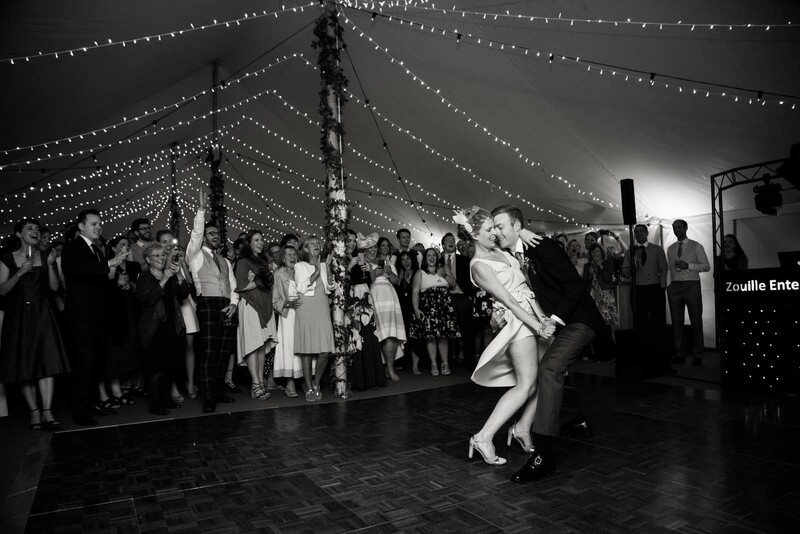 To start the evening’s proceedings the couple entertained guests with a well rehearsed tango, followed by an unforgettable evening of dancing. 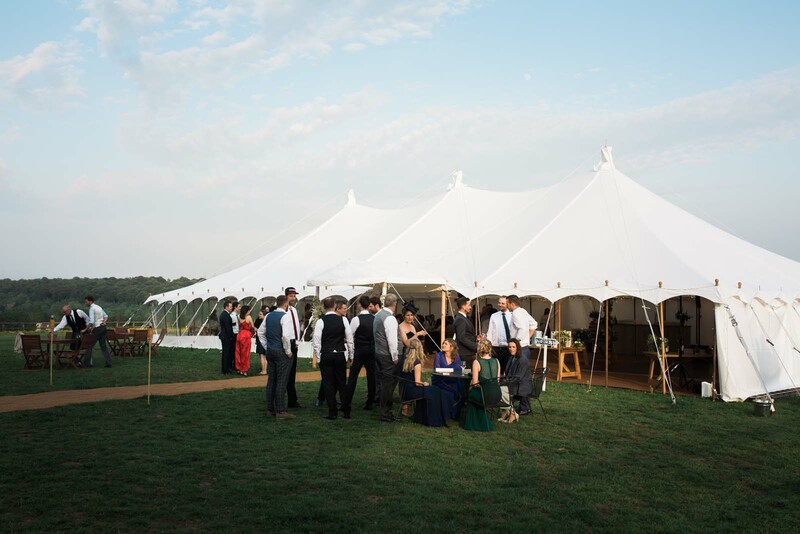 The setting was just perfect for a magical evening. 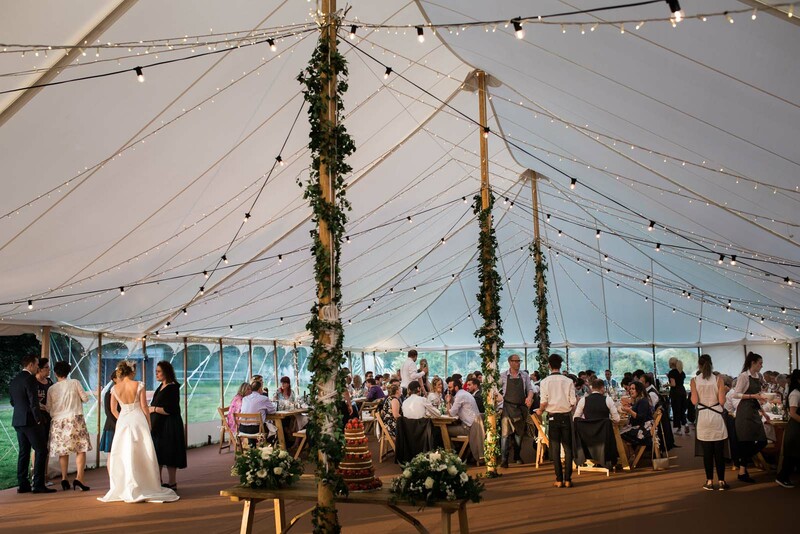 The marquee was lit with endless amounts of fairy lights, complete with a fire-pit and wood-fired pizzas. 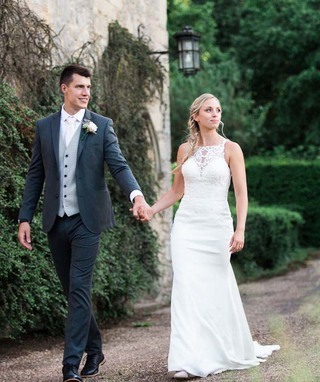 Congratulatons Steffi and Tim on your beautiful wedding day. 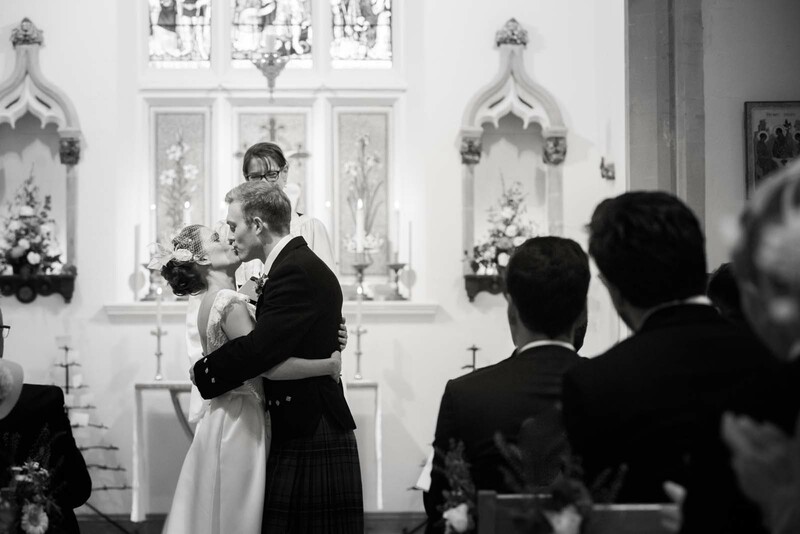 I truly enjoyed being there to capture every special moment. 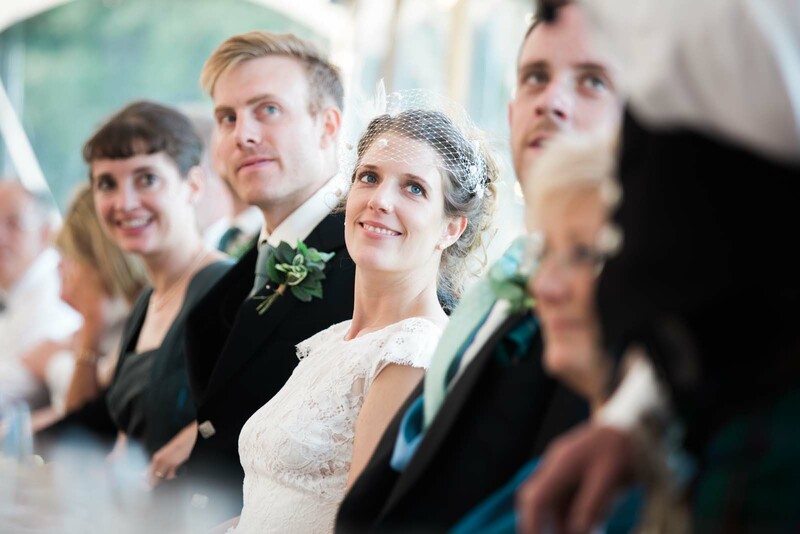 This is my five top shots from the wedding of Steffi and Tim, but please do look further down to see the highlights of this beautiful marquee wedding. 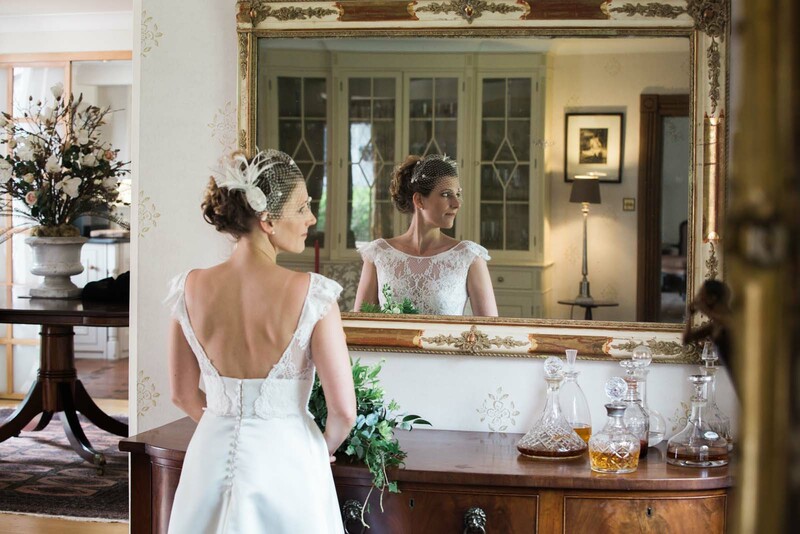 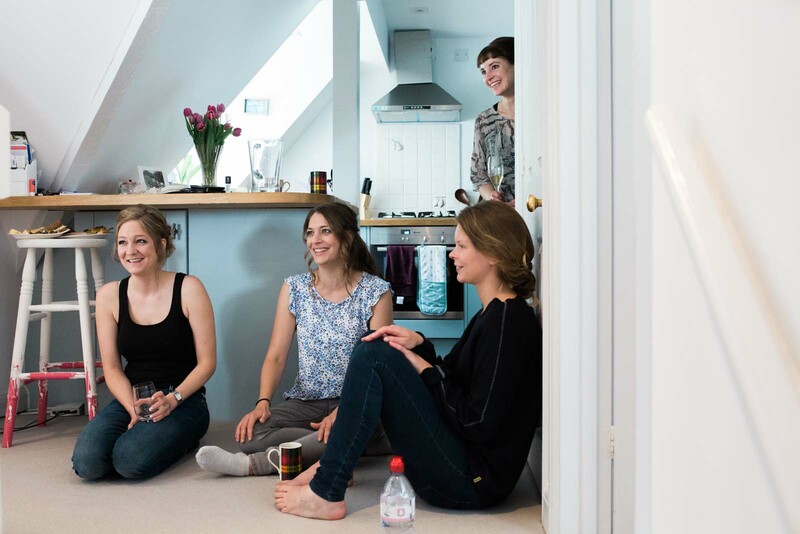 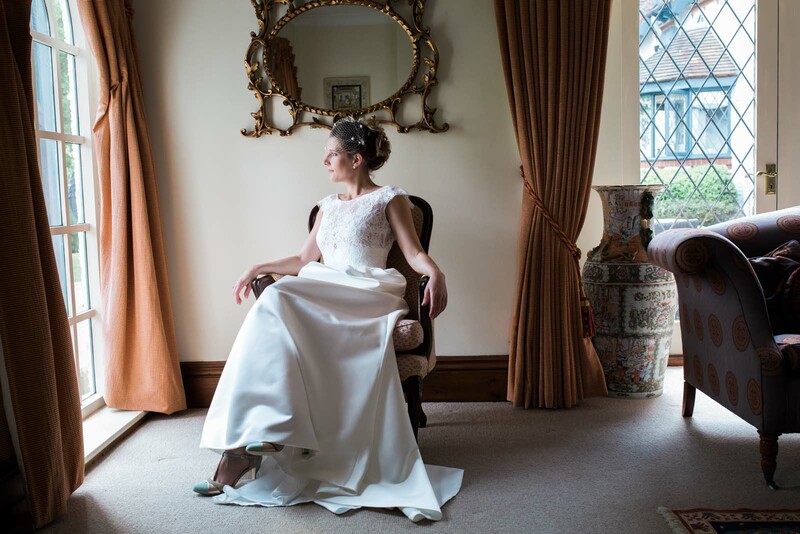 The family home at Hughenden Chase made for a beautiful backdrop for the Bride and her bridal party to get ready. 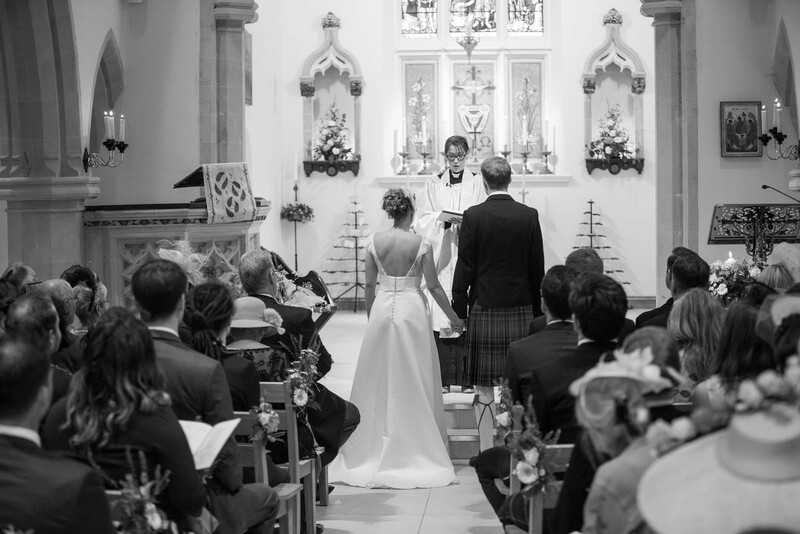 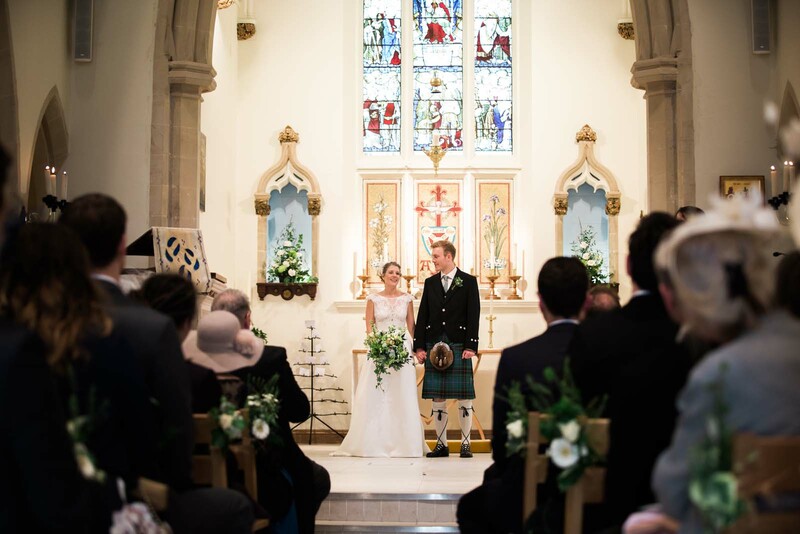 The couple chose to tie the knot at their local church in Preston, Buckinghamshire. 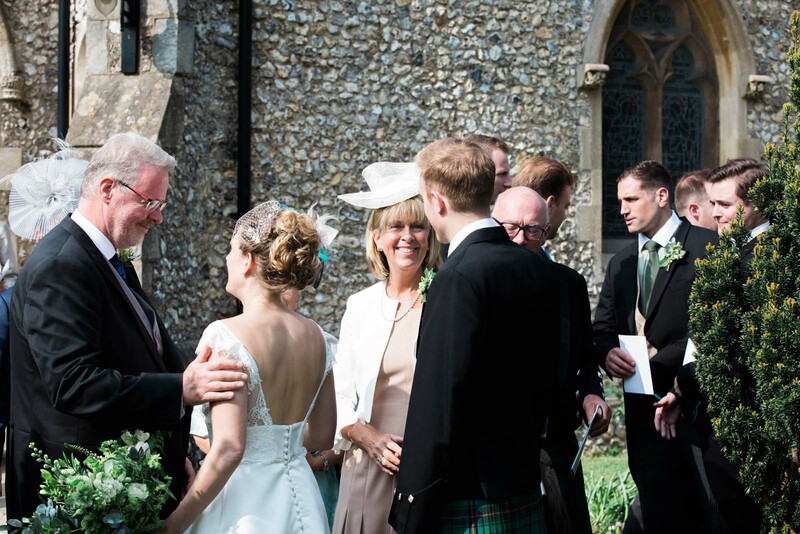 The church have been the centre of many important family events. 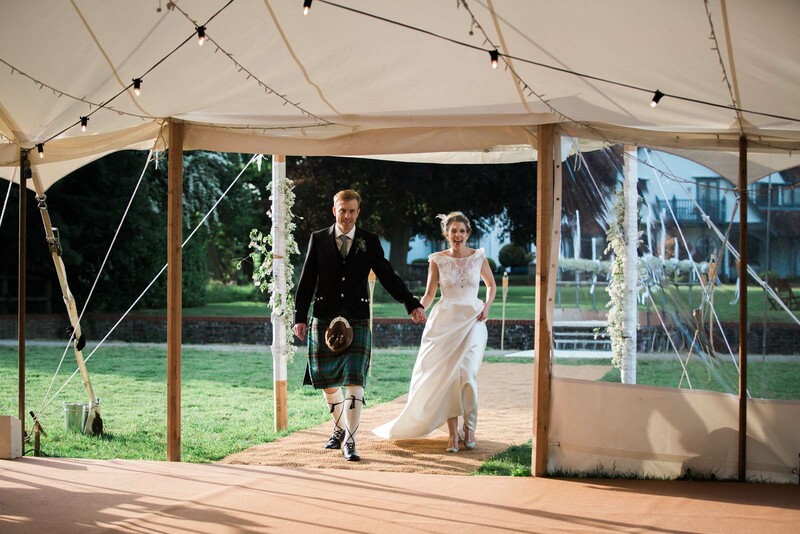 The wedding reception took place in the grounds of the family home at Hughenden Chase in Buckinghamshire. 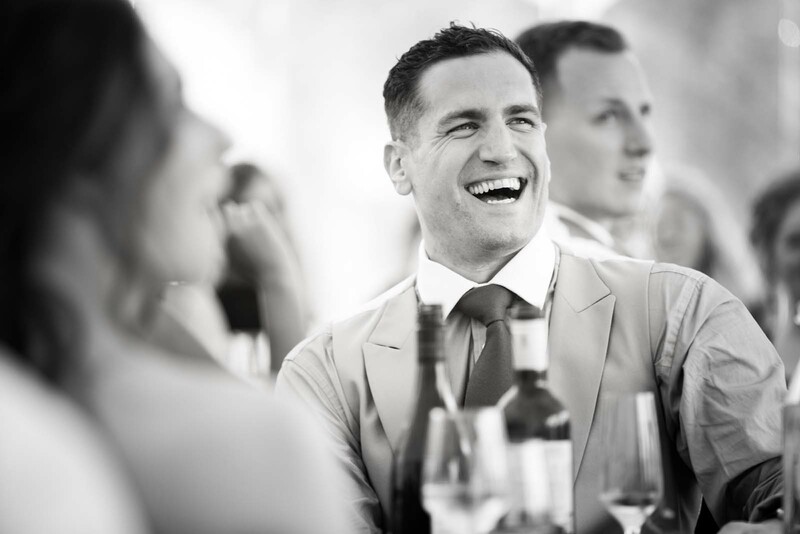 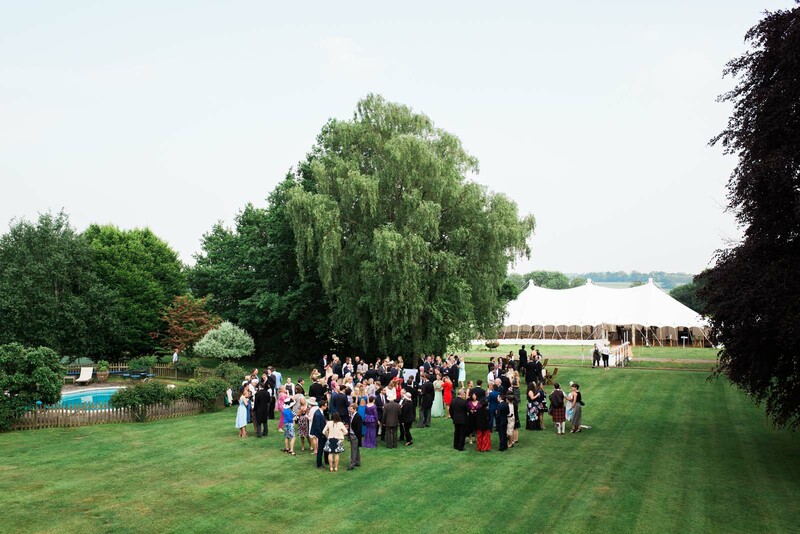 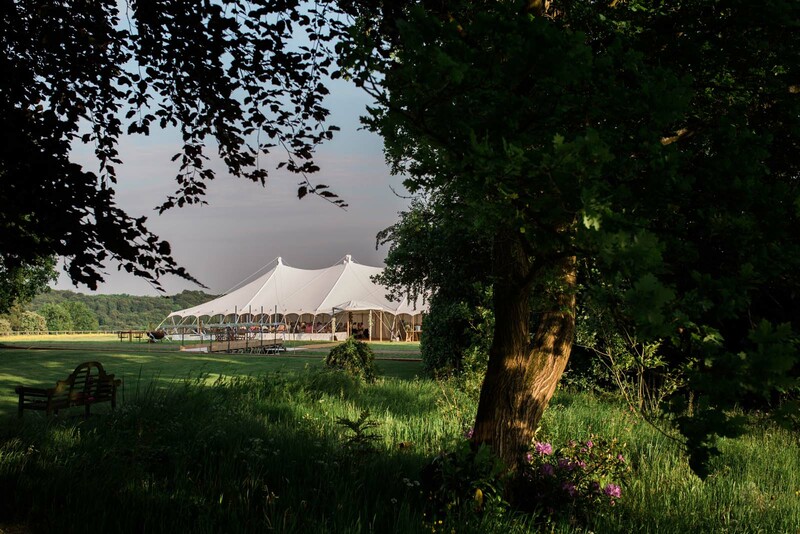 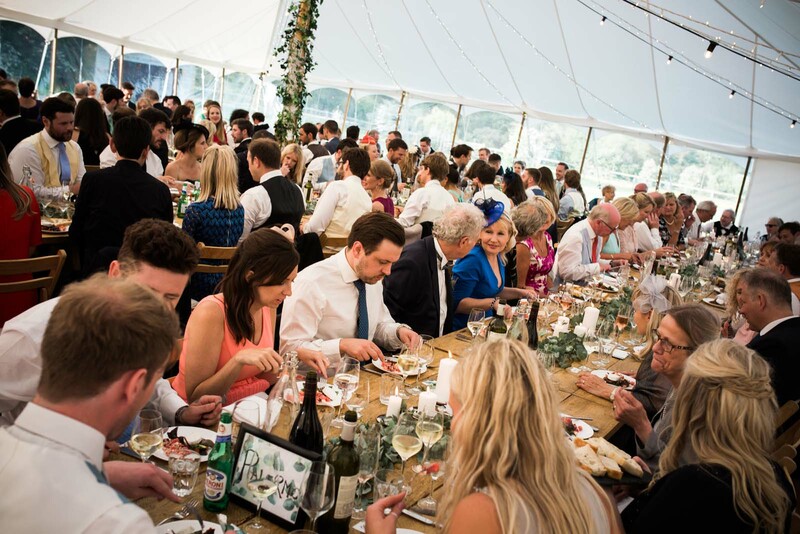 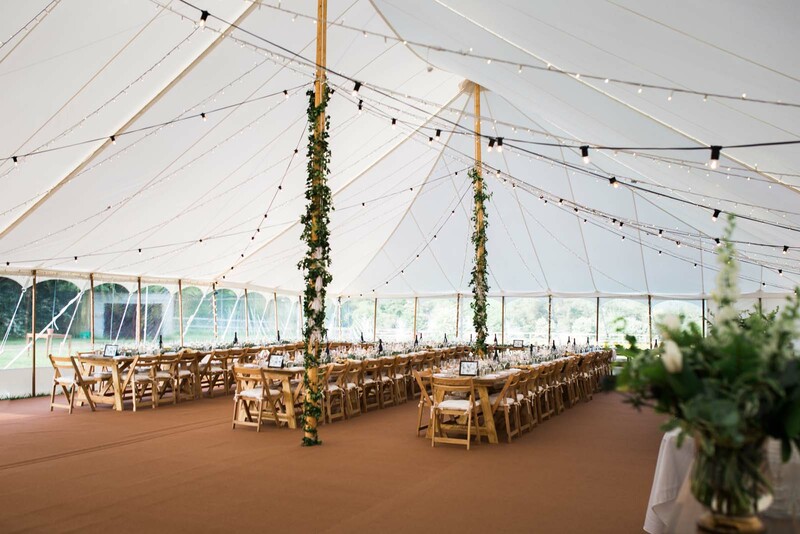 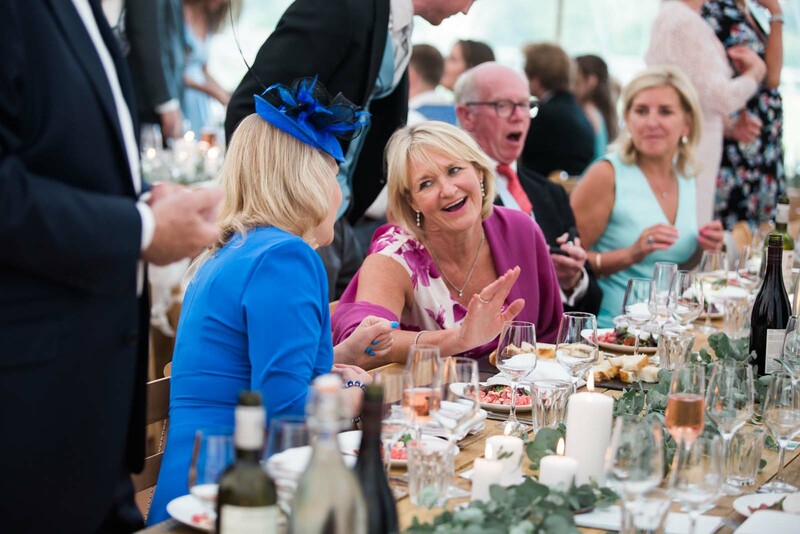 The extensive grounds created a perfect space for reception drinks followed by a format sit down reception and evening dance in a marquee. 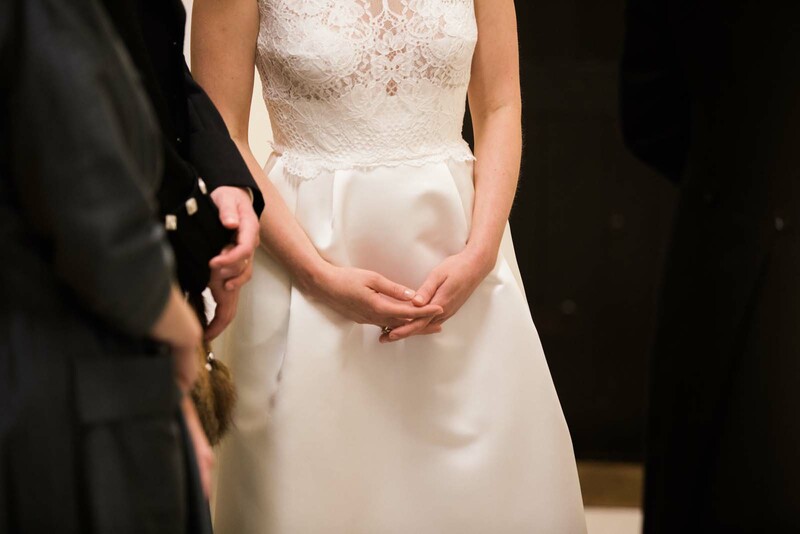 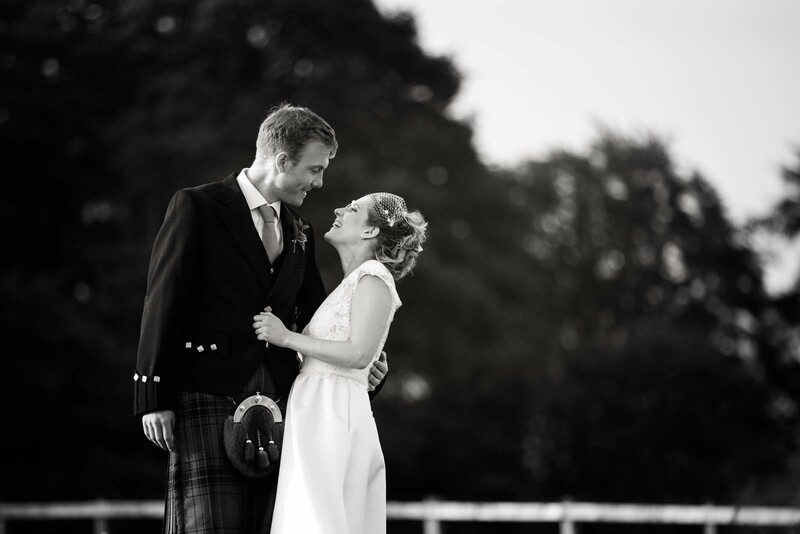 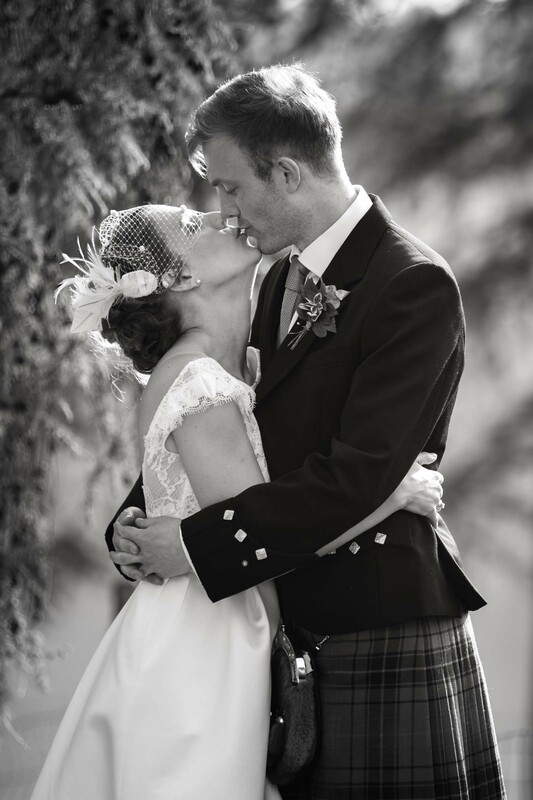 Do you have questions or would you like a quote for me to photograph your wedding? 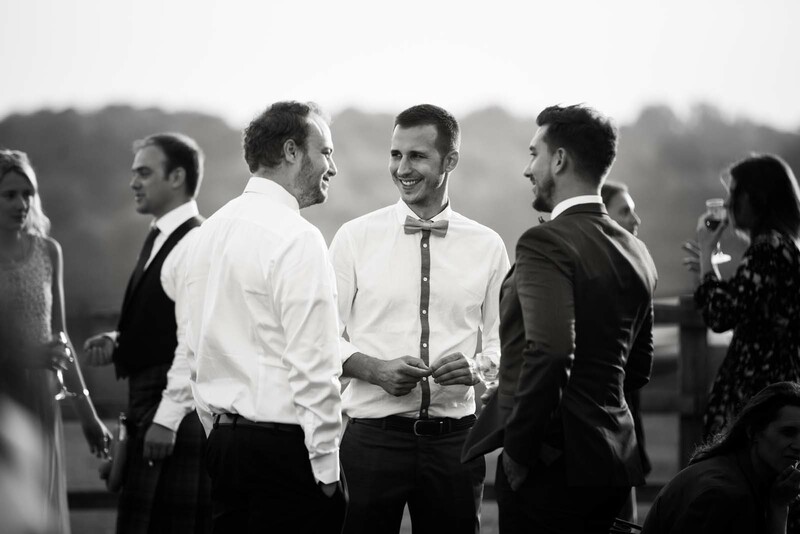 Please click the link below and get in touch.